What's Alan Watching? : Parks and Recreation, "Sister City": Viva Knope! I gave some of my thoughts on tonight's "Parks and Recreation" in this morning's column, so I'm wondering what everybody else thought. You booking a trip to Venezuela anytime soon? And were you as pleased as I was with Tom's decision on what to do with the tip money? "Tell that to the moon. Oh wait, that's right, you haven't been there." Again, much to love about this episode - feisty, smart Leslie; April; Tom first demeaning and then redeeming himself. And Fred Armisen, whom I'm not a big fan of, was good in this. A little too cartoony at times, but it shows what level the show is at if this is one of its weaker episodes. Still some very good moments. Somehow I don't see this one airing on Venezuelan state television any time soon. Loved Ron's talking head with the replica gun! And the jail line-o-rama. I found it strangely not that funny - at least not compared to how many times I've been laughing out loud in recent episodes. Some good stuff in there, and it was generally entertaining, just weaker somehow. The depiction of Venezuela was a bit offensive for sure but almost all at the expense of the bag of scum that is Chavez, so I was okay with it. Probably my favorite episode so far, but something about it just isn't popping for me. Makes me smile more than laugh. I did adore the Hillary Clinton joke you quoted in the article, though. So much so I shall quote it again! "That's why people respect Hilary Clinton so much: nobody takes a punch like her. She's the strongest, smartest, punching bag in the world." How often do cities normally do these "sister city" events? Because I think I've now officially seen it happen as a plot device on sitcoms more often than I've ever noticed it happening in any city I've lived in. I loved April in Spanish. April showed the language of deadpan boredom love knows no nationality. I loved April and her storyline. Wonderful stuff. But didn't have any interest in the A story. For me it was a dud like The Office. I wasn't comfortable stretching the "world" that they live in to have such over-the-top characters as the Venezuelans. Those characters wouldn't be acceptable in the world of The Office, and I always thought of P&R as in the same reality. The Venezuelans would have fit perfectly in the worlds of 30 Rock or Reno 911! (indeed, those come to mind because they both had this kind of over-the-top foreign dignitary characters). What I love about P&R are all the small moments between the characters. But this ep had none of that. Except for April and her Venezuelan suitor, which I loved, and which could have taken place in The Office reality. I'm still waiting for Andy to fit in with everything else on the show. Even Mark seems a bit peripheral this season. Donna and Jerry seem to be doing more in terms of comedy and plot. Tom put all of the tip money in an envelope and donated it (anonymously, but caught in the docu camera) to the Pit Park fund, which was sweet, especially after she'd just given up actual funding for principle. This episode just felt disconnected from the rest, like you could insert it anywhere. A throwaway episode. Completely agree with CDG. Plus, disappointed that there was no Louis CK. I think it was such a sweet gesture from Tom, and it really illustrates how much better (and more interesting and more fun to watch) the relationship between Tom and Leslie are this season so far than last. I totally went Awwww at that scene at the end. Fred Armisen isn't my favourite guy, but his prison speech was pretty funny. And it's nice to see the office be united as a front, like Swanson giving Leslie the ok to rip the check. Wasn't the best A story (because how would that scenario ever come up? Kind of cartoony ), but I thought it was still pretty great (and the best out of the four comedies this thursday) and fun to watch, and I'm liking the cast (and even the smaller side characters, like Donna and Jerry) more and more. Needed more Ron Swanson imo. I usually find Fred Armisen fairy creepy but he killed here. Anyone know if they let him go freestyle or if his riff was actually scripted? Agree that more Ron would be great. Really loved that Tom put his tip money in the pit fund. This episode wouldn't have worked at all in Season 1, but by this point they've gotten enough of a handle on Leslie Knope that her behavior here rang true to me. She was willing to ignore a lot of the obnoxious behavior of her Venezuelan counterpart, then cheerfully trying to show him the joys of life in Pawnee, and then finally tearing up that check with Ron's support. April's the character most improved this year after Leslie; now that they've shown her blank/rude exterior hides a lot of problems, it's fun when she actually shows she's good at something like she did here with the useful Spanish. And even though having Tom put all that ill-gotten money into the Pit/Park fund was not hard to see coming, it was still a nice ending. 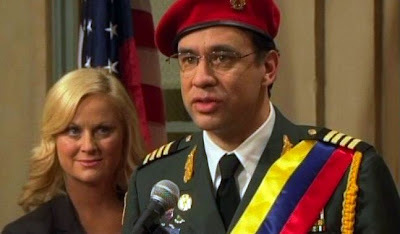 Little facts: Fred Armisen is part-Venezuelan in real life, and that "1992 pistol" from Venezuela was a delightfully nasty way to refer to a failed coup there. Led by the current leader. Who now seems to find coups vile and unthinkable. Even the town hall participants were hilarious. The first time I watched the Raul's "jail" talking head, I kept getting distracted by the guy in the blue shirt. As soon as I saw Fred Armisen i knew it was gonna be a good episode. I really enjoyed this episode even though we didnt get to see as much of the normal cast as usual but it was still a quality episode. Like always when ron swanson stole the scenes he was in. he continues to be my favorite character. I found this episode uncomfortable to watch.. There are some episodes of Office and this episode here where it leaves the humorous and becomes taxing and not fun. It put me in a bad mood like the Office episode where everyone roasts Michael.